Brunei annually observes Royal Brunei Armed Forces Day on May 31. This is a public holiday, that celebrates the establishment of the Brunei Malay Regiment in 1961. 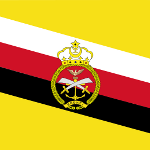 Brunei became a British protectorate in 1888. The first steps towards independence ware made after World War II, when a new constitution was written. In 1961 60 Brunei recruits started regular training as a part of transition to total independence of Brunei from the British Crown. Brunei gained independence in 1984. The first Brunei military forces were formed on May 31, 1961 and named the Brunei Malay Regiment. In 1965 it was renamed to the Royal Brunei Malay Regiment. In 1965 the regiment established two units, the Air Service and the Boat Section. In 1972 the regiment structure was changed: an aviation, navy and infantry were split into three separate units – the Royal Brunei Land Forces, the Royal Brunei Air Force and the Royal Brunei Navy. The Royal Brunei Land Forces itself formed three battalions and the Support Unit.